Discussion of newer designs, copies and reissue offset-waist instruments. This is my first post (after much non-registered lurking), but I could use some help. 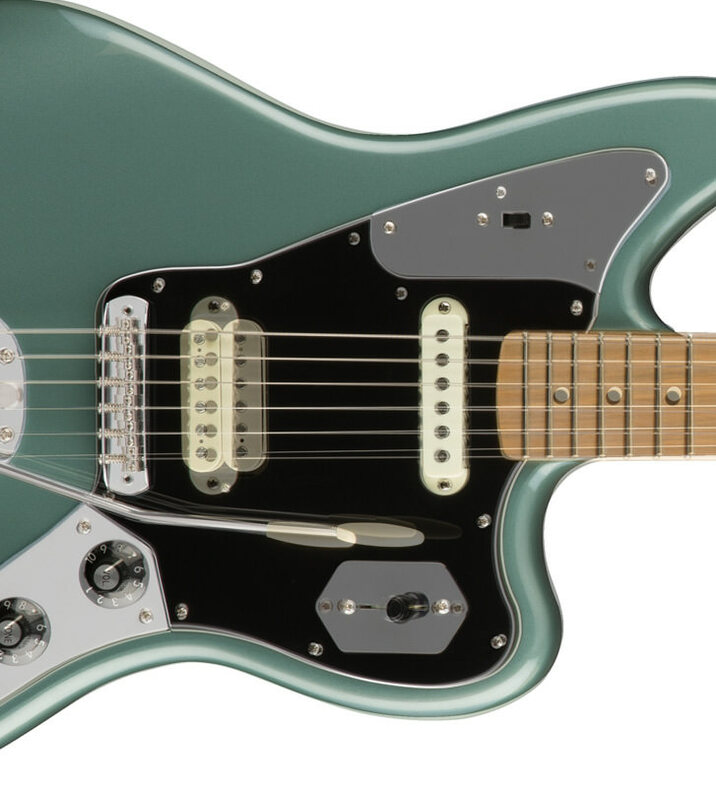 I'm looking at getting one of the new Player Series Jaguars (Tidepool) because I want a Jag body that is configured for a humbucker in the bridge and a Jag pickup in the neck. Has anybody gotten one of these Jaguars and looked at the routing? I want to know if the control cavities are still cut open enough for the classic controls so I can retrofit with metal plates and more controls. There's a reference to another thread with the Jazzmaster routing, but obviously this one will be different since it has controls up top. I, too, am curious about the routing of the Player Series Jag. I did photoshop an overlay (quickly & sloppily) of the Player Jag over an Am Pro Jag. A few screw hole differences but it looks like the plates and switches line up. That there's only a HB route on the Player is a high probability I think. The only caveat being how much of Fender's images were the creation of their art department and not a photo of the finished product. I'm sure some Fender dealer in '64 looked at the new Duo-Sonic II and thought, "That's not a Duo-Sonic. That's a Mustang". The lower cavity looks like the normal size but the upper cavity is going to need a little routing done if I put do the two roller knobs and switch configuration. This is routed big enough for two humbuckers, and they get the Jaguar-style single coil in there by direct mounting to the body through that cavity with a double stack of foam. It's kind of goofy, and I'm actually not super impressed; not only is it a weird mount but mine is mounted a little too far forward so it comes up crooked through the pickguard. - I was skeptical of the trem because it's not the same as the ones with the slide lock. It's actually amazingly stable. - The bridge seems to work really well and I like the modern version with the single cut saddles instead of the vintage style. - The saddles are adjustable, which is good for me because I have a compound radius neck and it's really flat near the bridge compared to Fender necks. I have to get shorter saddle screws because they are poking out and annoying me when I palm mute. - It's a good weight; not too light but not too heavy (haven't put it on the scale yet). - I thought I was going to hate the stock bridge pickup because it is Alnico III. Turns out it's actually pretty badass when I play distorted. I'm still trying to figure out how I feel about it clean (tapped or not) and the neck pickup and how they work together. - Tend to play really hard and have a tendency to hit switches that are under/over the neck pickup. I am not having that issue with this style of switch at all (I definitely do with the switches on the modern Mustangs and Les Pauls). I was thinking about getting one of those too and was wondering about the same thing. But more about the pickup cavites then about the upper horn as I wanted to make it a standard single coil (or a double humbucker) version (both together still look mismatched and weird to me). But man, I do love that color! I re-arranged the saddle height screws on the aftermarket version of that bridge (Fender 0081239001, which appears to be the same as the one available for $10 or less on ebay) for the same reason - now they don't stick out the top of the saddles into my hand. IIRC stock they were 10mm on the middle saddles and 8mm on the outer ones. I swapped the 8mm to the middle saddles and got some 6mm M3 grub screws on ebay for the outer ones (CP neck I used is 9.5" radius). With your flatter radius neck you may need a different mix (8mm all across ?). I also swapped the M3 intonation screws from the supplied 18mm to 16mm - at least one was very close to fouling the string forward of the saddle (too-long screws seem to be common on import metric bridges). Thanks for the screw recommendations, Timtam. Thanks for posting this update, the topic is interesting to me, I was hoping someone had some answers. Bridge PU is actually a Shawbucker, like the HB on the AM PRO series. I changed out the bridge pickup with a Pearly Gates Plus to see how different it sounded. The resistance measurement I made is close to the bridge specs you posted (measured open circuit). I didn't write down the neck pickup resistance, but it was something like ~6 kΩ, which seems pretty far off the neck number you posted; is the neck pickup value set from Fender as well or were you using the pickup off the American Pro Strat number? I kind of like the stock bridge pickup, but it has a high enough output that I struggled to find a distorted sound that didn't sound nasty; I'm always riding the line of enough to sound badass but not so much that it sounds like I'm drowning in intermodulation. The stock pickup really seems to put out too much signal for me at this point; I might go back to it and see if I can make it work for me. The PGP is lower output but also has an inherent badass sound. Also, I've found that the PGP sounds more "surfy" when I'm using it with the neck pickup in this guitar, at least to my liking. The only thing that's out is the PGP seems to have tighter pole spacing, and the stock pickup already wasn't lined up with the strings that well. It sounds fine, but still. I also was thinking to use a PGP if I will change the PU on that Jaguar (buying one next week, so I'll give myself some time to at least try to love those pu without exchanging 'em). The numbers I posted are from Fender Customer Service chat, so I just reposted what they wrote to me. IDK, while Fender is spamming everywhere their Shawbucker, and while concept is pretty interesting (even if a bit overthinked), seems like public reception on those pups is "meh" or no reaction at all, at best. They should excel in pre-distorted sounds, I think, hipster docet. I easily can imagine that they would sound nasty if overfeeded. What about the PGP splitted sound? Probably in a low-to-medium gain concept as this guitar is, that coil split switch is the least useful thing on a still interesting instrument. The split (and even the full) on the PGP seem to get me more where I want if I'm trying to get a surf sound out of it than with the stock pickup. I get that it's not a "real" Jaguar with a humbucker, but it seemed to get a lot closer with the split combined with the neck; it adds the "chunka chunka" part of the Jag sound that I think the neck is kind of missing on its own. I think I could probably find an amp setting that really worked for the original pickup setup, but I didn't want to trade that for the kind of distortion I usually play with. Has anyone tried putting an Am Pro plate at the top? I was wondering whether this actually worked or not. 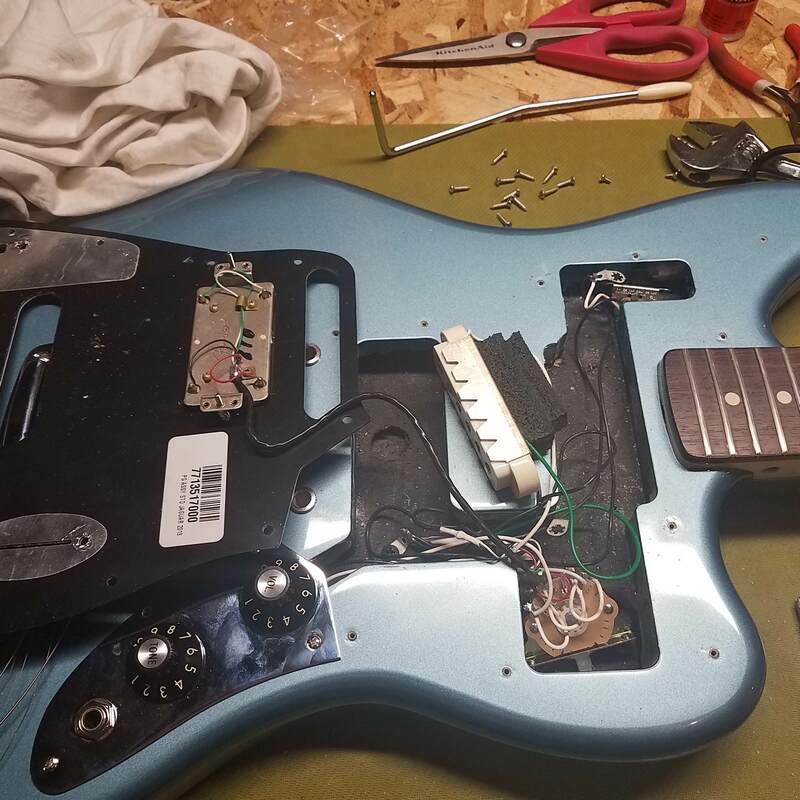 There would be some difficulty involved in that, as the Player series jag's HB coil split switch is on the pickguard not a plate. So to add an Am Pro switch plate (or any standard-style jag upper switch plate) you'd need to cut the Player pickguard for the plate (PITA without proper pickguard routing tools), or go with a standard jag pickguard blank and get it cut for the Player's SC and HB. But either 'could' be done. Couldn't you get a Marr pick guard? I was thinking that the suggestion was to use an Am Pro metal switch plate with the existing Player series HB and single coil setup ... which was perhaps not battery_boy_3000's intention. But if the aim is to switch a Player series jag to two jag single coils then yes a standard-style pickguard should work, with a pickguard-matching set of metal switch plates - ideally the Am Pro upper plate as it is the only plate with just a single switch .... so most likely to fit the reduced-size upper cavity. The Marr plate has two switches so less likely to fit. But if you are swapping the HB to a single coil, the question then becomes what would that single upper switch do ? Phase ? Strangle ?